The original King's Quest was a landmark in computer gaming. In 1984, authoress Roberta Williams designed the original King's Quest to demonstrate the power and versatility of second generation computers. It became one of the industry's largest sellers. Hundreds of thousands of people have played the game - and loved it. Years later, it is still viewed as a cornerstone in the development of computer adventuring. Another step forward in adventure design. 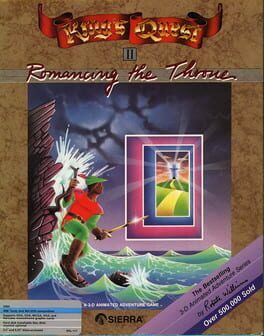 In answer to the popularity and critical acclaim of King's Quest II: Romancing the Throne. Romancing the Throne carries on where King's Quest left off - both in pioneering technology and in enjoyable game play. King's Quest II: Romancing the Throne takes the technologies initiated in the original King's Quest and refines them into an art form. "It's like playing an animated cartoon" claims Compute! magazine. The animation and music in the game are unparalleled in the realm of computer adventure. In King's Quest II, Roberta Williams continues the saga of Graham, now King of the land of Daventry. His quest to rescue a princess locked away in a tower that is both miles and dimensions away. The adventure begins on a deserted beach, and will take the player to undersea worlds and into a vampires castle. The answer to Graham's challenge lies behind a magic door and its three keys which unlock untold secrets. Players of the original King's Quest will not be disappointed in this second installment of the King's Quest saga. Consumer Software News writes "if you liked King's Quest you'll love the sequel" Computer Entertainment reports that " Roberta Williams has simply outdone herself" and the Questbusters journal says that King's Quest II has "the most lushly painted and highly detailed scenery seen since...well King's Quest I." By mixing the best elements of text adventures and arcade quality graphics. 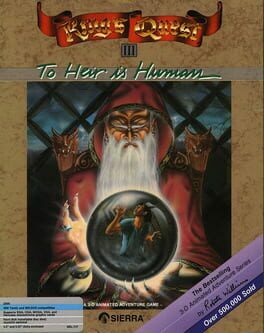 King's Quest II establishes a whole new standard in computer gaming by which future games will be judged. A middle-aged male virgin named Larry Laffer desperately tries to "get lucky" in the fictional American city of Lost Wages. 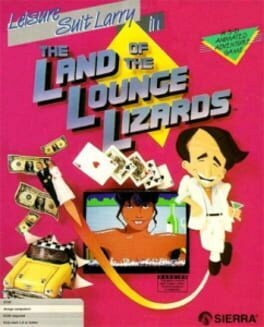 Your goal in Leisure Suit Larry in the Land of the Lounge Lizards is to find and seduce the girl of your dreams. This goal won't come easy, because you only have one night, and unfortunately, you are stuck with Larry's looks. Other problems, such as lack of money, lack of opportunity, and bad breath can complicate things significantly. Your interaction with the game controls the outcome of each situation. For example, having your character sign on with a major league baseball team or start a successful men's magazine could be beneficial to your ultimate goal. On the other hand, catching a fatal disease or losing all your cash can only impede your progress. A combination of common sense, logical thinking, and downright sheer luck is needed to achieve your goal. Be prepared for a spectacular adventure, three times larger than any previous Sierra adventure, a landmark in computer gaming that transcends existing standards of computer graphics, sound and animation. Powerfully dramatic, King's Quest IV evokes emotion like no other computer game with a unique combination of lifelike animated personalities, beautiful landscapes, and soul-stirring music. Sierra has recreated the universe of King's Quest, a world that one moment will pull at your heartstrings, the next moment place terror in your heart. Uniting the best programmers, artists, and musicians in the business, Sierra has created a constantly evolving universe where landscapes change from day to night, characters roam freely, and dramatic music interludes tantalize your emotions in a complicated tale of faith and mistrust. Your quest begins with a full-length cartoon and proceeds to plunge you into a fantasy world of mystery, intrigue and enough plot twists to confound even the most dedicated adventurer. Embark upon a perilous journey into the darkest corners of the King's Quest universe. Not one, but many successful quests must be completed to save the royal family from a tragic destiny. With a surprise introduction and an equally unexpected conclusion, plot twists abound as you strive to discover the mysteries of a strange land, overcome its hostile inhabitants, and reveal the secrets hidden therein. Roam the grounds at night and discover areas which remain hidden during daylight hours. Travel swiftly, as time is of the essence, and each moment brings the royal family closer to ruin. 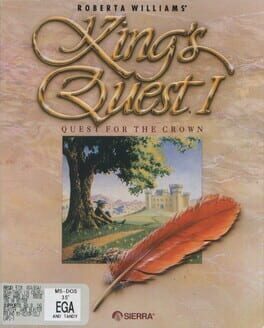 With over 50,000 units sold in it's first six weeks of release (on just one computer), King's Quest III was the best received software sequel of the year. As the game moves to other computers, it is quickly becoming the best-selling 3-D animated adventure game in history. Like it's predecessors, King's Quest III breaks new ground in the development of adventure games as an art form. "Questbusters- The Adventurers' Journal" praises the "several exceptional innovations introduced in King's Quest III" including the addition of pull-down menus, special self-mapping features and an advanced parser. King's Quest III also breaks new ground in the area of puzzles and plot. The complexity of the storyline, and the intricate game puzzles, make for a game that will challenge even the most experienced adventurer. Subplots include an escape from slavery, piracy on the high seas, and the mastery of powerful magic. King's Quest III is a graphics extravaganza with plenty of color, animation and quick screen changes. The locations and characters of King's Quest III are the most lifelike and interactive to date. The soundtrack, which includes well-choreographed music and funny sound effects, adds new dimensions to the viewer's enjoyment. In fact King's Quest III was nominated for "Best Music in Computer Software" by the Software Publisher's Association. The most fun you can have playing computer adventure games! In 1983 Roberta Williams and her team of programming artists designed the original King's Quest playing system. Four years later, King's Quest games are still the most enjoyable adventure games available. Roberta Williams is designer of the King's Quest series. Over the last half decade, Roberta has worked closely with The Walt Disney Company and Jim Henson in the development of computer software. Her games have sold more copies than any other woman in computer software history. ...But he doesn't do windows. Strap into your computer station and prepare for blast-off. If the thrilling graphics don't blow you off your chair, the laughs will have you rolling on the floor. If you can help Roger Wilco he could use it. Hey, wake up! Roger Wilco's the chief sanitation engineer (a.k.a. Janitor) on the starship Arcada. His mission: to scrub dirty decks... to replace burned-out lightbulbs... to boldly go where no man has swept the floor! But while he was napping in the broom closet, his starship was hijacked by the Sarien Stormtroopers. Now the top-secret Star Generator's been stolen. And if Roger doesn't get it back, the universe as we know it is toast! Kaboom! The Two Guys from Andromeda often travel the cosmos under the aliases of Scott Murphy and Mark Crowe. 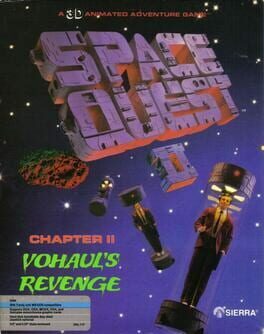 They're best known for their award-winning Space Quest series and their frequent sightings with Elvis. Just when you thought it was safe to go back into space, He's Back! And he wants revenge! Sludge Vohaul, the demented evil scientist (whose sinister plan you unknowingly foiled in our last episode), is seething over his Sarien slip-up. Madder than a drenched Astrochicken, (and still determined to rule the galaxy) Vohaul has devised a new plan. A nasty plan. A plan so evil that only one as wickedly sadistic as he could imagine it. Yes, the worst nightmare ever is about to come knocking on your door- and it won't take No for an answer! It's The Invasion of the Insurance Salesmen! Hordes and hordes of pushy, obnoxious (genetically engineered) salesmen will soon be dumped upon your home planet- unless somebody dumps on Vohaul first. And who knows more about getting dumped on than you? Have fun staying out of trouble! Beat the odds. Conquer insurmountable obstacles. Defy gravity. Cry for help. Misfortune awaits you at every turn… Boggle your way through the humid stenchlands of the jungle planet Labion. Blunder your way onto the asteroid fortress of the slime-sucking Vohaul. Flounder your way through more perilous escapades than you can wiggle a space worm at. Guaranteed to make you laugh! 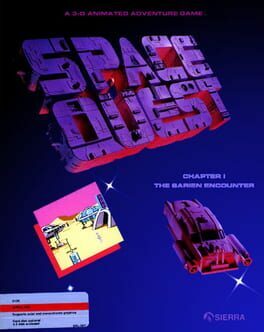 Packed with comedy, tragedy, suspense, horror, and many other nouns, Space Quest II will tickle your funny bone and relieve that heavy feeling in your wallet.